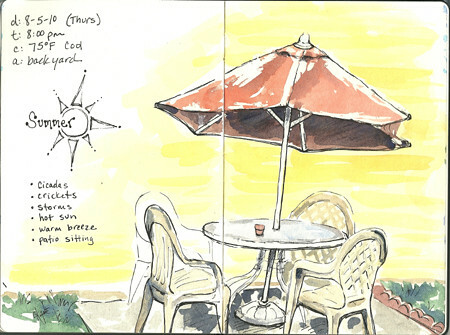 Summer Patio Sketch – Let's Paint Nature! In my area it is time for summer. That time of year when the days are long and hot, the nights are short and cool and the crickets sing a soothing song. In my backyard, I have a tiny patio with a small table, perfect for getting away. When I can’t escape to the woods, I like to sit out there and listen to nature. It is my summer sanctuary. Speaking of nature sounds…there is a great site you may want to visit called, The Music of Nature. It is a group of people whose mission is to celebrate the nature at hand by presenting sound recordings and videos. You can find samples of birds, insects, coyotes, and frogs. Try it out, it’s just a bunch of fun! I’m going to try to sketch my backyard quiet time space this weekend! This morning, in my Prayer Swing, a cicada kept me company while I was journaling. It was sitting there on the wood support and allowed me to get close to see its intricate green wings. I just love the way they sound at night and have been wanting to see them when they are buzzing but after looking at this fellow this morning, I can see how they look like part of the tree. Next time I see him, I’ll take a picture but I’ll try to find a picture of one on the web and see if I can paint one! Really nice sketch of a special place. Thanks for the heads up on the Music of Nature. That’s really cool! I like the sketch–looks so much like summer. Thanks for the website link–I will check it out. I really like this sketch. Alanna: Cicada discovery, soooo cool! It’s neat to be able to study an insect up close, gives you a better appreciation. I can’t wait to see your backyard sketch! You go girl! Linda: Thank you! Even if we move, I will always have that sketch to remind me of happy backyard summer times. Lana: You are welcome, very cool site!